With everything that happened in Miss Universe 2015, first runner-up Miss Colombia Ariadna Gutierrez Arevalo posts on her official instagram account wearing the crown. 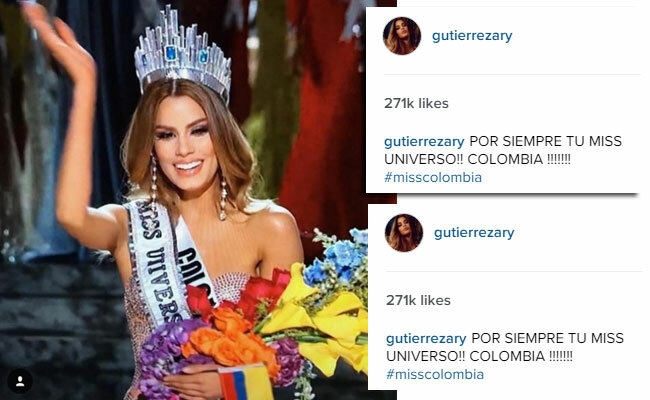 The 21-year old Colombian first posts a photo her smiling with the crown with a caption "POR SIEMPRE TU MISS UNIVERSO!! COLOMBIA" which means "Forever your Miss Universe, Colombia". 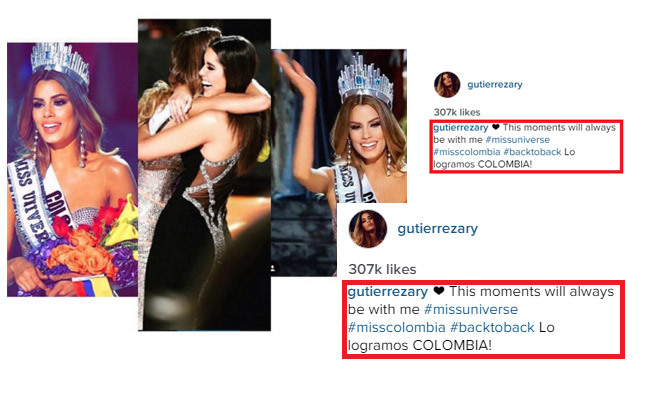 In her second photo she posted her victorious moment with Miss Universe 2014 and fellow Colombian Paulina Vega hugging each other that could have been the first back to back victory for their country.It had a caption "These moments will always be with me #missuniverse #misscolombia #backtoback lo logramos Colombia". She recieved mixed reactions with her posts. Her supporters congratulated and gave her encouraging messages while some were enraged for they think that Arevalo was throwing shade to the real winner Miss Philippines Pia Alonso Wurtzbach. The recent Miss Universe became so controversial when the host of the pageant Steve Harvey announced a wrong winner during the live telecast. When it was between the Philippines and Colombia, Harvey proclaimed Miss Colombia as the new Miss Universe. Arevalo was able to wear the sash and the crown while celebrating with former Miss Universe Paulina Vega. She even blew flying kisses to the crowd while walking to the front stage until the host returned and apologized to the audiences that he made a huge mistake and it was a human error. He revealed that Miss Colombia was only a runner-up and the real winner was Miss Philippines. With the awkward situation that happened in the prestigious pageant, many memes appeared online and made fun of it. They said that Arevalo had the shortest reign in history of Miss Universe. Miss Colombia gave her opinion on the pageant by saying that everything happens for a reason.